Plastic is not one single material. It consists of numerous materials with various properties. Some plastics are elastic and soft as cotton, others are hard and strong as metal. Rani Plast manufactures plastic films which are mainly used in different types of packaging solutions. They have very different properties depending on the area of use. Some must be extremely durable, others as thin and light as possible. A stretch film, used for packing the characteristic silage bales, ought to be elastic. A shrink film, used for packing of beverage cans or bottles, should wrap the contents tightly, but still be easy to open. The manufacturing process and the raw materials used for plastic films are however the same. The plastic type in the film is called polyethylene. The manufacturing process is called extrusion and the machine used for making the films is called extruder. The manufacture of polyethylene was developed in the 1930s and Rani Plast’s founder, Nils Ahlbäck was acquainted with the method in the early 1950s in Sweden. 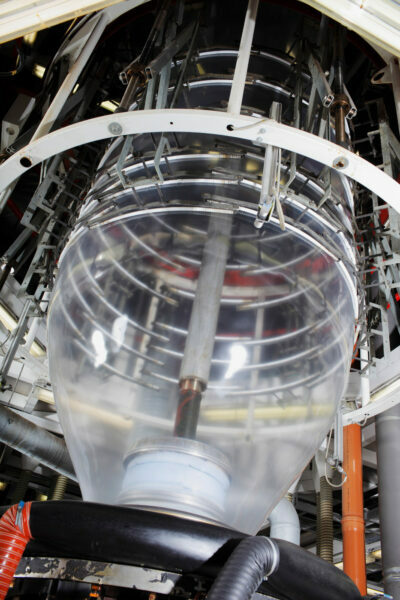 In the extrusion process the polyethylene is first melted, and after that, forced through a die that is filled with air in order to create the required width of the plastic film. The thickness of the ready film is determined by the output speed. The extruders come in different types and sizes. The dies can be between 4 cm and 1.8 m diameter. The largest one is 50 metres tall and can produce plastic folios in widths of up to 22 metres. The so called co-extrusion is the extrusion of multilayer plastic film. Through producing plastic film in many layers it is possible to create film that combines a variety of properties: rigid, sleek, adhesive or glutinous. Rani Plast can co-extrude plastic film of up to five layers. The plastic film factories have welding machines, with the help of which the plastic film is welded to become plastic bags or sacks. There are also printing machines similar to the printing press machines used by printing companies. These machines can print up to eight colours, in a quality that comes close to photo quality. The raw material comes to Rani Plast in the form of rice-sized granules. 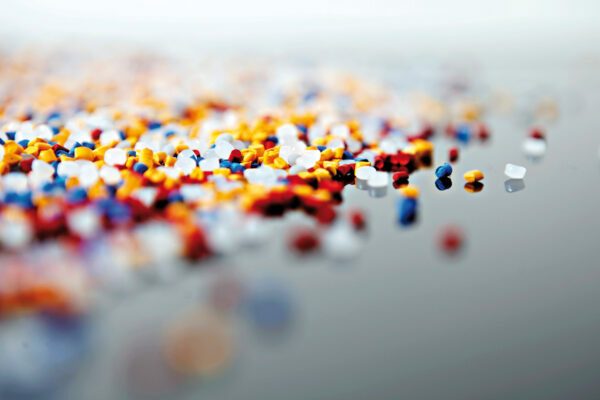 Different granules contain substances with different properties, for instance antioxidants, UV-protection or substances that make the plastic sleek. In some cases the additives are blended with the granules at Rani. The polyethylene is a white powder and its raw material is the gas ethylene, which is extracted from raw oil or natural gas. Polyethylene can also be made from different plants. In Finland polyethylene is manufactured by Borealis, whose production facilities are located in the refinery area in Sköldvik in Porvoo. The raw material for the plastic industry is generated through the same refining and cracking processes as petrol, diesel and oil. Only four per cent of the raw oil in the world is used for plastic production. In many aspects plastic is environmentally friendly, not least because it saves energy during transports. Polyethylene only consists of the elements carbon and hydrogen. That means that it is stored energy, which can be recycled through incineration. A printed plastic package draws attention. The print on the plastic surface exposes the brand and promotes the product in the shop and during transport. The consumer gets the necessary information about the product without opening the package. The possibility to create a selling product branding is one the material’s most important advantages compared to other packing materials. 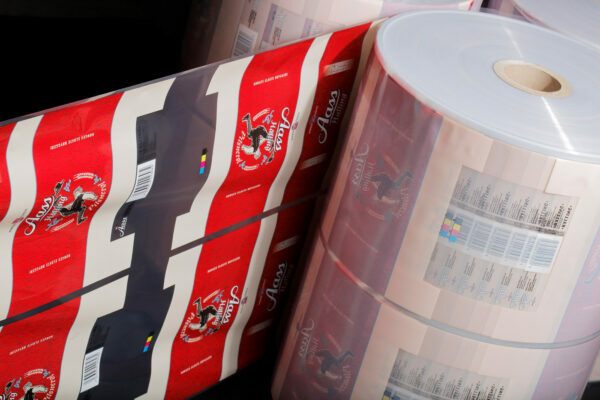 Rani Plast has invested in the most modern flexo printing machines on the market and we can offer printed films for the needs of most industries. We can print up to eight different colours on very wide films. We have both printing machines with a central drum and stack printing machines; this enables us to optimise the relationship between price and quality according to our customers’ needs. Rani Plast’s recognisably high printing quality is a consequence of continuous product development. It has resulted in very fine and selling film qualities with the highest possible transparency and gloss for exposing the customers’ brands and messages. We have also developed films with matte surfaces as well as different speciality varnishes for customers looking for different solutions. We have machines which can print on the inside of the bellow of sacks, bags and other products with a bellow. Hence the brand is maximally exposed on all sides of the package. For customers who need only a simple print we can offer inexpensive films which are printed in line during the extrusion process. If a film is not printed in a special machine the price will remain competitive. Rani Plast’s experts will gladly give further information regarding our special offers on printed films. Most of our package films are printable. We will help you to find the optimal packaging solution for your products.